He sinks into the armchair next to the bed like a tired gorilla. Gray stubble, stringy hair, red nose, gaping pores. At first glance, one might think that he had a bit too much Rioja the night before, but his only visitors were a couple of people from the White House who stayed late. He slept two, three hours, then an idea, a message, a thought jerked him out of bed, as is so often the case. Bannon doesn’t drink alcohol, only water, coffee and Red Bull. His bedroom is that of someone who views his life in the context of history, someone who is obsessed with battles and fights, and who surrounds himself with violence, death, adrenaline, importance. On his bedside table are books about Adolf Hitler and World War II, next to the bleached jawbone of an alligator an acquaintance sent him from Florida. The room is a re-creation of Abraham Lincoln’s bedroom in the White House. “Only much brighter and twice the size,” says Bannon. The shelves next to the bed are packed with war literature. Bannon has two turbulent years behind him. In August 2016, Trump appointed him campaign manager before then hiring him as chief White House strategist. Newspapers described him as a combination of Mephisto, a nihilist and a rogue — and as someone who waged ugly battles with Trump’s favorite daughter, Ivanka Trump, and her husband Jared Kushner. In August of last year, Bannon left the government after Chief of Staff John Kelly grew tired of Bannon’s provocations. After that, his conservative financial backers — hedge-fund billionaire Robert Mercer and his daughter Rebekah — withdrew their support. Ultimately, Bannon also lost Breitbart. Suddenly, he was alone, without money, without friends, without power and without his killing machine. Trump called him “sloppy Steve.” Everyone laughed. He lifts himself out of his leather armchair. In five hours, his flight leaves for London, where he will be making an appearance at an event organized by Bloomberg, the media conglomerate. Then he will meet with Marine Le Pen, head of the right-wing party formerly known as Front National (now called Rassemblement National, or National Rally) in Paris. He talks about the United Kingdom’s exit from the EU, about 19th-century Russian serfs and the rightward lurch in Europe. It was mid-August when he extended the invitation to visit him at his home, which he calls the “Embassy,” located in Washington D.C.’s Capitol Hill neighborhood. Visitors are initially led into an apartment on the ground floor with a low ceiling, stuffy air and Fox News on the TV. This is where Bannon’s crew sits. Filmmaker Daniel Fleuette is busy packing his suitcase for his next trip. Bannon’s nephew Sean, who handles the stream of visitors, is zipping around. A man hacks away on his laptop while a woman named Elaine says she is just helping out. A Brit named Raheem Kassam, who used to be an adviser to Brexiteer Nigel Farage, occasionally stops by. Working for Bannon isn’t easy. The boss might spontaneously decide to travel to Texas and order them to come along. Fleuette draws deeply on an e-cigarette, engulfing himself in a cloud of smoke. “I bike to work every morning, 20 minutes, that’s all the workout I get these days,” he says. On the table are several notepads from hotels Bannon has stayed in, covered in chaotic notes. In the basement, keyboards are clacking, cell phones are vibrating. Washington in August is busy talking about the book by Omarosa Manigault Newman, the former Trump employee who accused the president of racism. One day earlier, Bannon told friends, the White House had called asking if he would go on a Sunday talk show to defend Trump. Bannon said he would happily do so, but only if Ivanka went on before him. Trump’s favorite daughter is Bannon’s archenemy. He is still happy about this nasty anecdote, partly because it shows that he hasn’t entirely been forgotten at the center of power. Bannon says that there is radio silence between him and Trump and that they only communicate via their lawyers. Special Counsel Robert Mueller is still investigating whether Trump’s election team in 2016 cooperated with the Russians and Bannon had to testify. He needs to be careful, he says. We sit down at the dining room table and he picks up a book, a biography of the philosopher Martin Heidegger. “That’s my guy,” Bannon says. Heidegger, he says, had some good ideas on the subject of being, which fascinates him. This is what conversations with him are like: He jumps from the depths of politics to the heights of philosophy, from the swamp to Heidegger in five seconds. What sets us apart from animals or rocks, Bannon asks? What does it mean to be human? How far should digital progress go? His nephew Sean announces the next visitor. “Get some water,” said Bannon. On the walk to the door, he points to a photo on the mantlepiece showing his oldest daughter Maureen six years ago in Iraq. Maureen was a soldier in the 101st airborne division of the U.S. Army. In the photo, she has an assault rifle in her lap. “She’s sitting on Saddam’s throne,” he says, smiling. Like Trump, he thinks the United States were taken advantage of by Europe for decades. He says Germany’s rise after World War II was only possible because American soldiers provided security at the risk of their own lives and with the support of American taxpayers. The best way to understand Bannon is to picture him as a travelling salesman peddling ideas that he hopes might take root. Trump, Bannon once said, was an “imperfect vessel” for his revolution: personally flawed, ideologically flexible, but great on TV. Bannon needs vessels, he needs incendiaries. He will only be satisfied when the flames are blazing around him. It’s a Saturday in late September as he walks onto a stage in Rome. The right-wing splinter party Brothers of Italy invited him to their party convention and by chance, Bannon had a bit of free time. Behind him, Darren — a former British infantryman who is in charge of security for Bannon — has his arms crossed in front of his chest. Bannon speaks without a script. His talk begins with the low birthrate in Italy, touches on microchips and genetic design, and ends with the extermination of humankind. 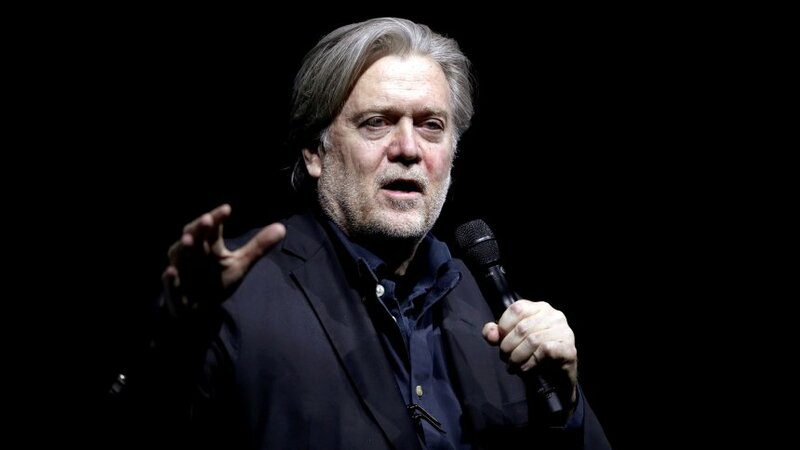 If we allow the elites to hold onto power in London, Paris, New York and Silicon Valley, Bannon says, they will completely redefine homo sapiens in 25 years. “The ultimate destruction of the human race!” he yells. Then he climbs into his limousine and drives back to his five-star hotel on the Piazza del Popolo. Instead, he charters a private jet and flies to Prague for a half-day visit with Czech President Milos Zeman. AfD lawmaker Petr Bystron, who comes from the Czech Republic, is there as well. Speaking by Skype from Berlin, Bystron says the atmosphere in Prague was relaxed: “Zeman’s spokesman came in sneakers.” He says there was coffee and cake, they complained about the European Union and the president listened as Bannon described his project. The next stop: Budapest, for a meeting with people close to the country’s right-wing prime minister, Viktor Orban. Three days after his trip through Eastern Europe, God’s representative is sitting in his suite in Rome. There are croissants and coffee on the table and Bannon is wearing a hoodie with the words “US Army” on the front. Raheem Kassam, the former adviser to Farage, is busy hammering out emails on his laptop. Bannon says he was happy to learn the previous evening that Merkel’s preferred candidate for her party’s parliamentary floor leader had lost. He sees it as confirmation that the Berlin establishment is approaching the end. The apocalypse is on the horizon. “We’re on the right side of history,” he says. 25-Prozent-Aufschlag: Hilfe für arme Senioren: «Plus-Rente» oder Grundrente?